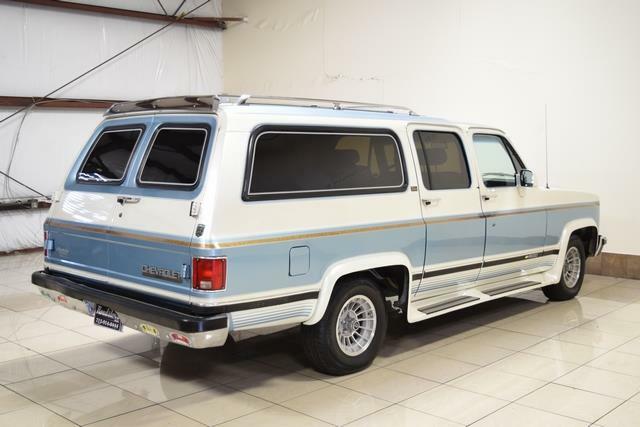 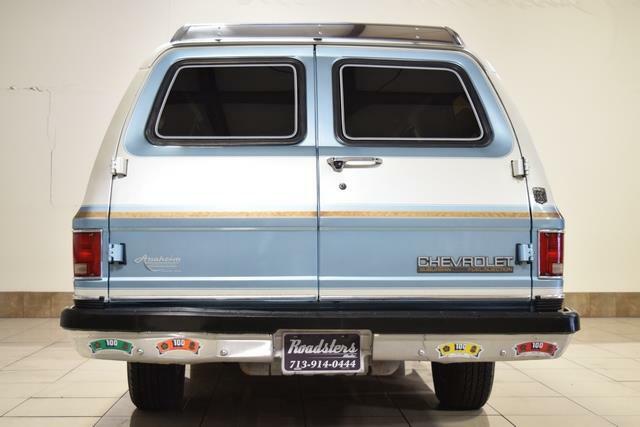 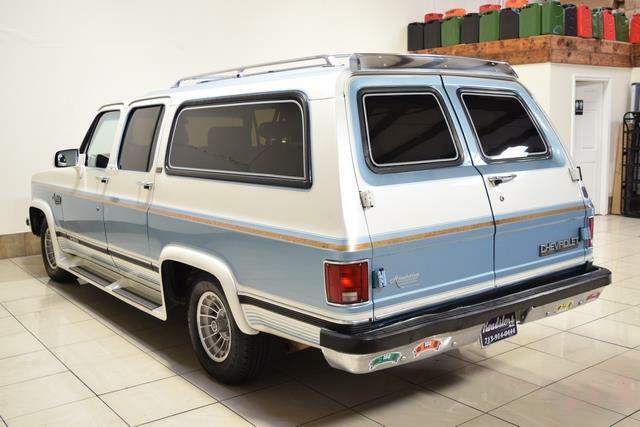 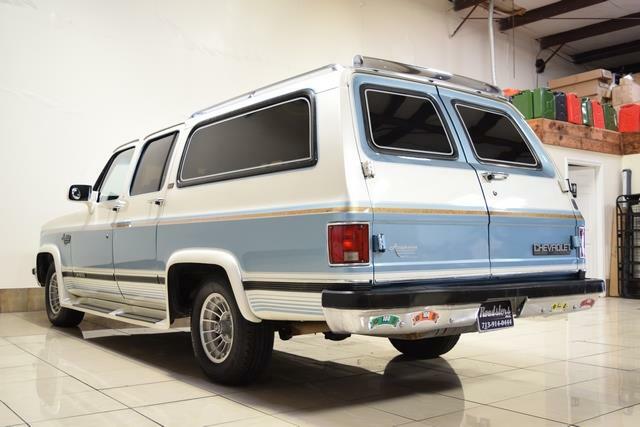 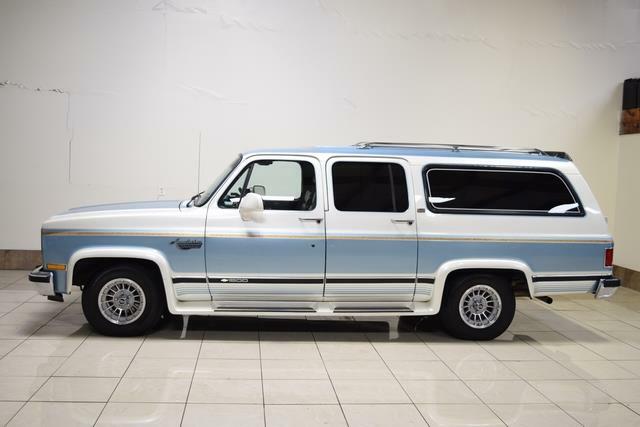 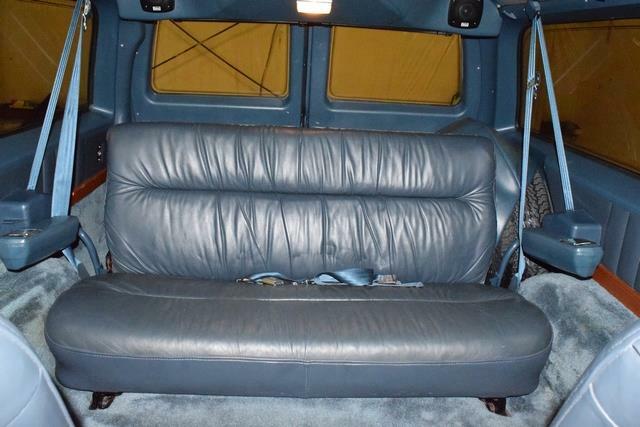 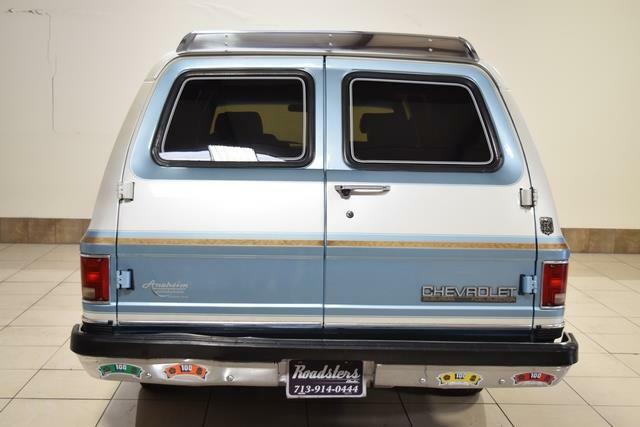 Pretty rare conversion, over 3 years until I discovered the first Anaheim Industries convered Suburban. 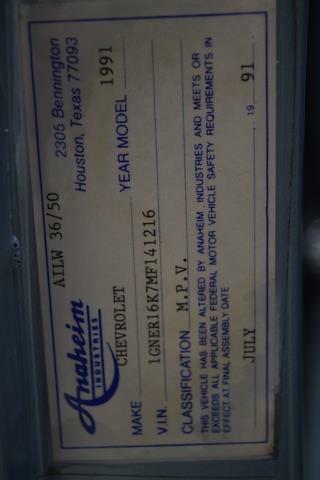 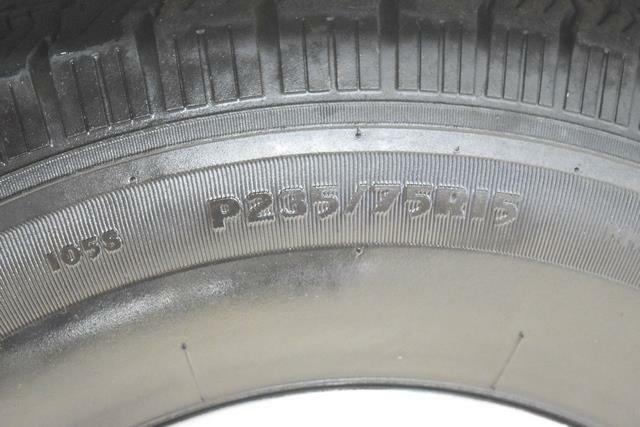 Originated out of Houston Texas, their address was 2305 Bennington, Houston Texas 77093. 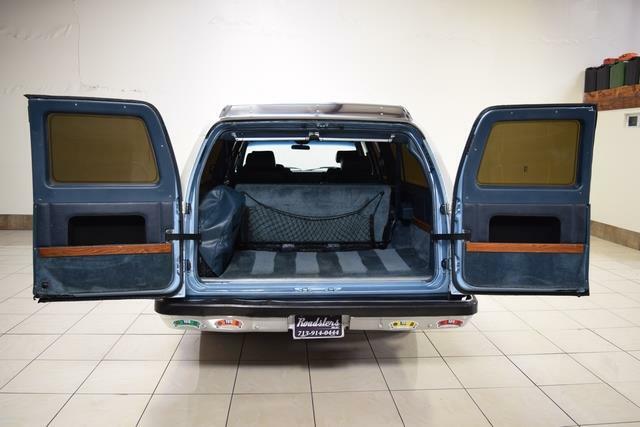 I did find a 1996 Suburban with an Anaheim Special Edition package so they must have been fairly successfull to have been around for at least 7 years. 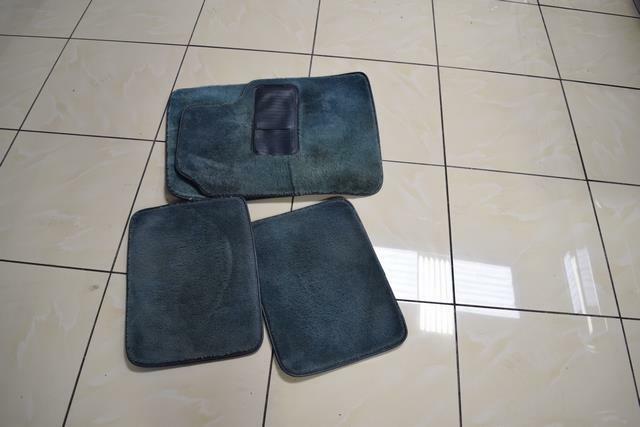 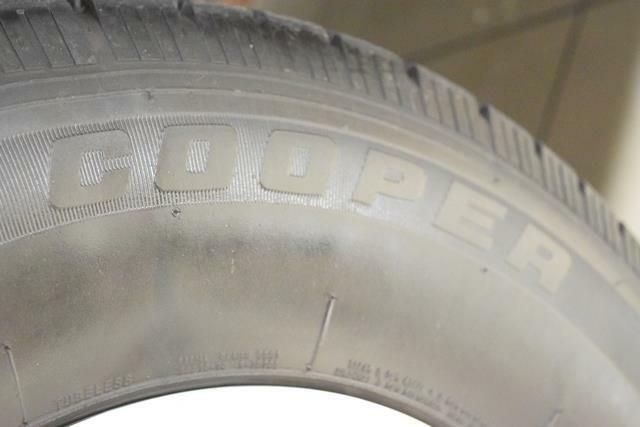 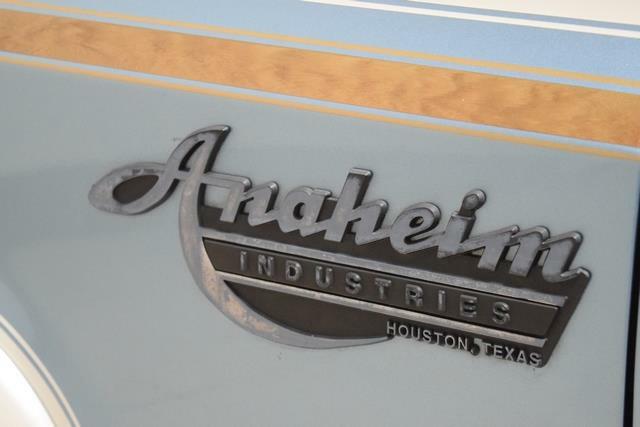 I read they were in a lawsuit against GM (Anaheim Industries, v. General Motors Corpo) but lost. 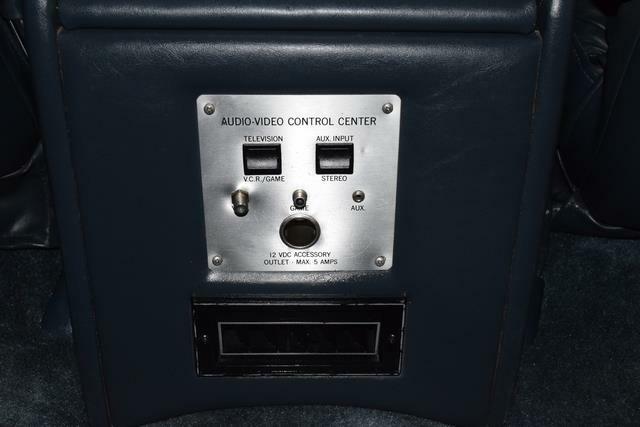 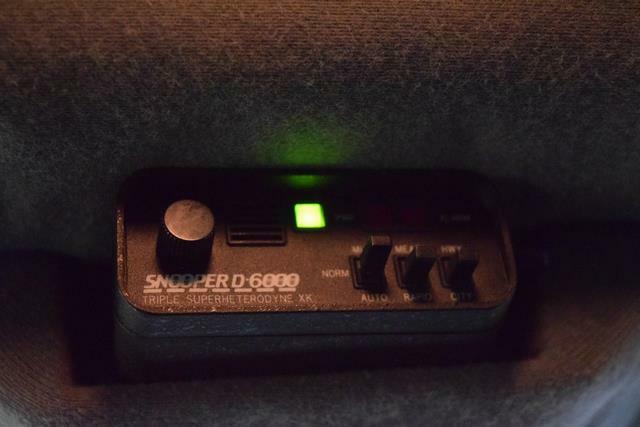 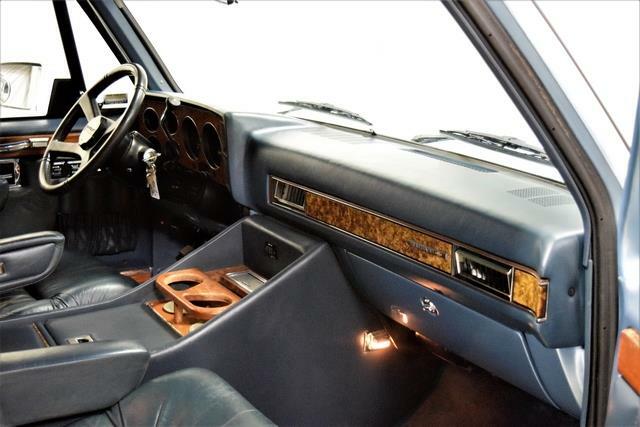 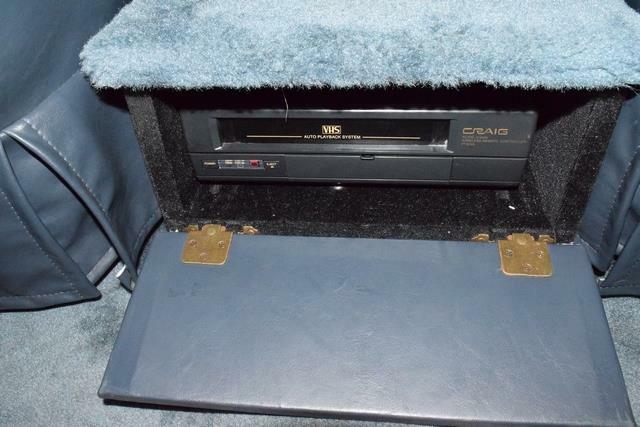 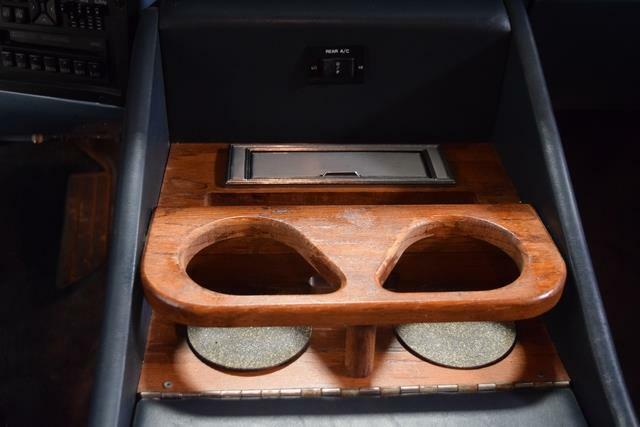 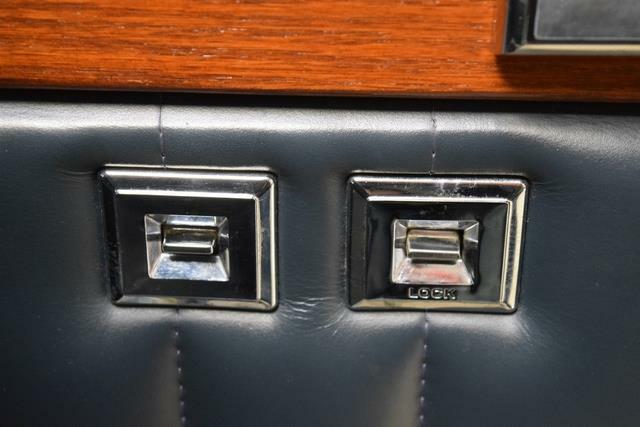 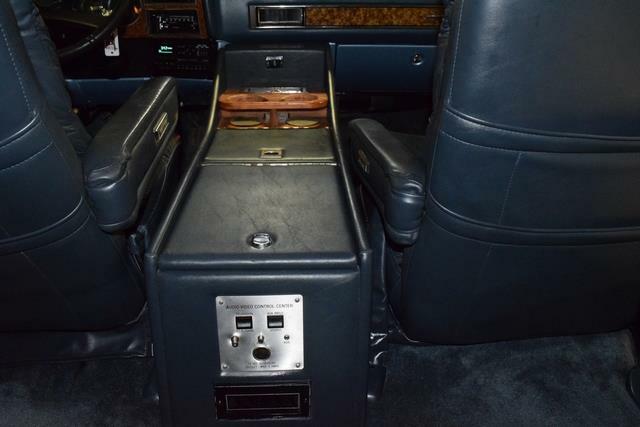 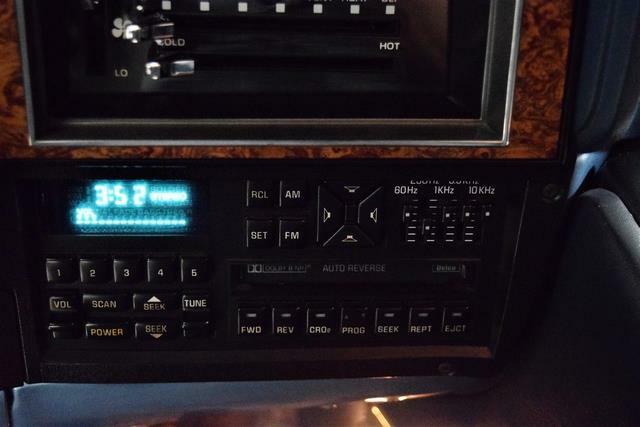 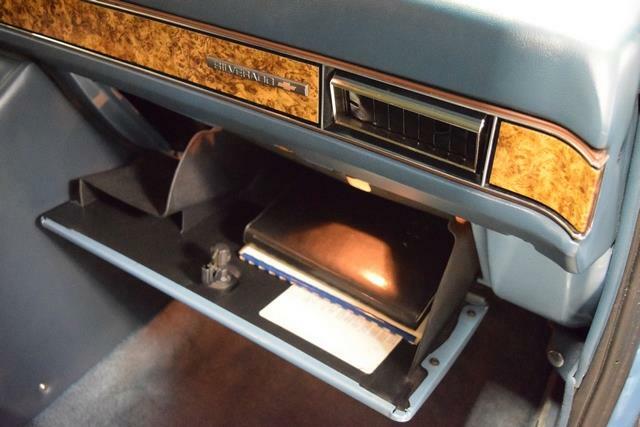 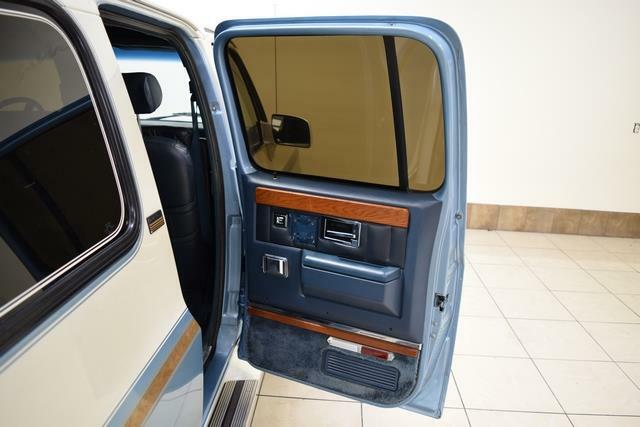 Their conversions had a lot of options in 1991 including TV/VCR combo where the tv pops up out of the rear part of the center console, leather power seats, vinyl spare tire cover, vinyl door panels, pinstriping around the rear windows, oak accents on the interior, huge center console with cooler compartment, it's the biggest console I've seen in a Suburban, reminds me of a van, oak trim on the lower door panels, courtesy lights, rear speakers mounted in the rear A/C valence, radar detector, fog / driving lights, audio-video control center, full length integrated running boards, American Racing rims etc. 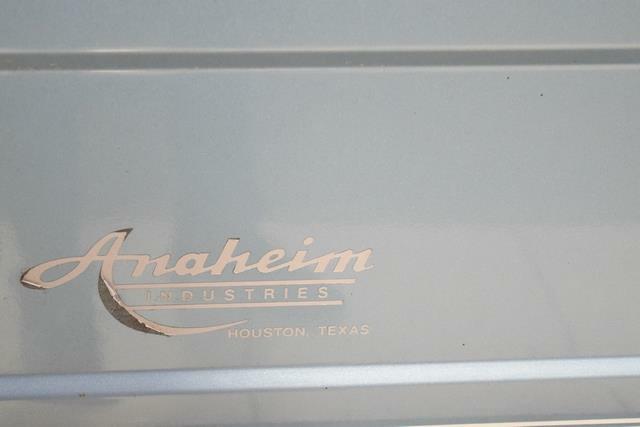 If you see an Anaheim Industries Converted Suburban that is not listed here or have information about the company, please email me!! 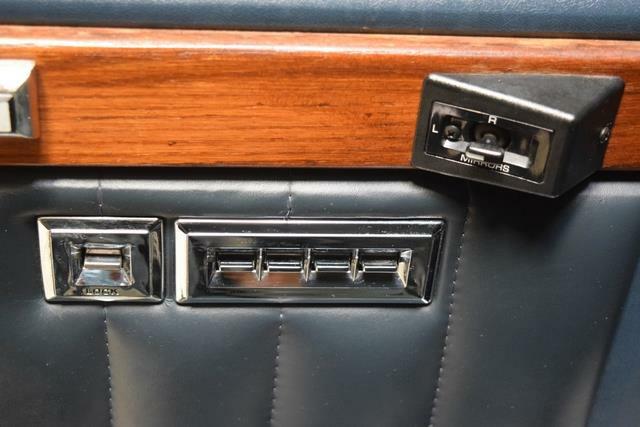 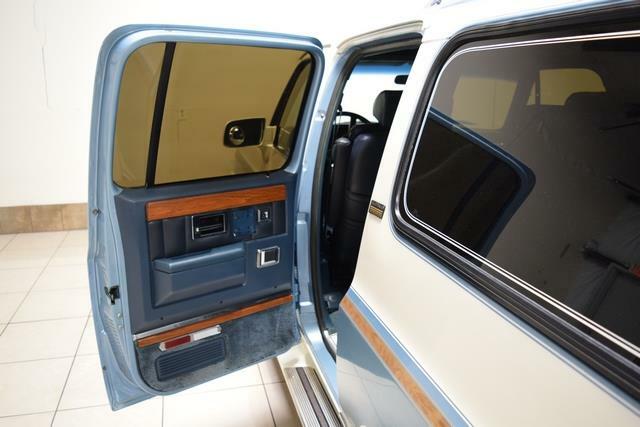 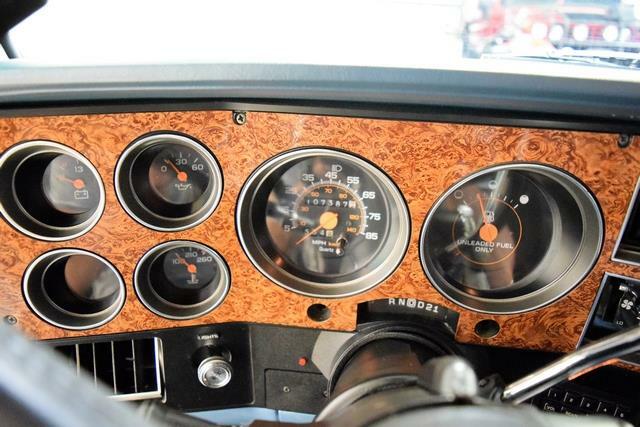 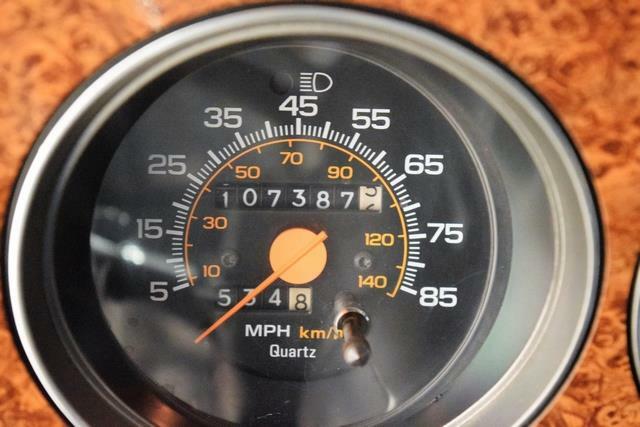 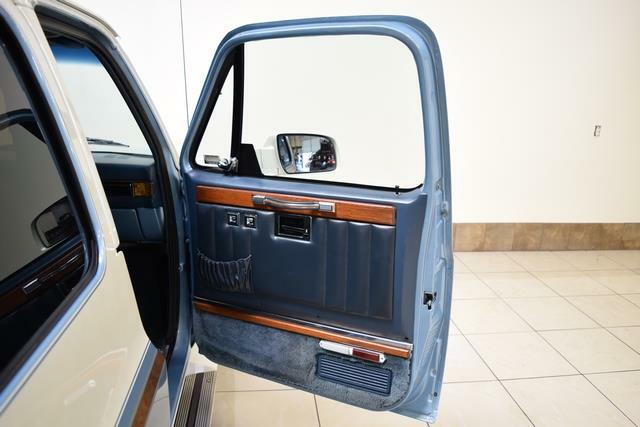 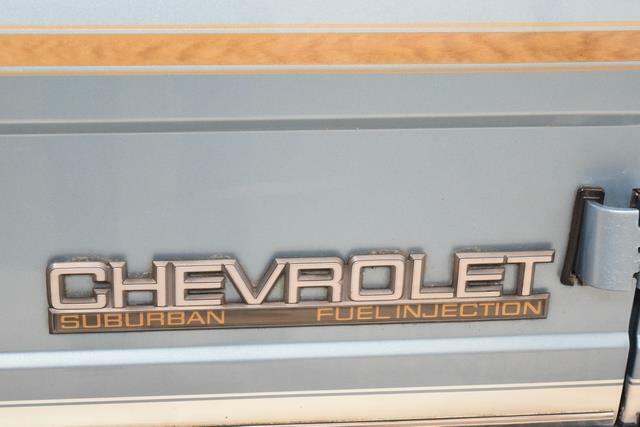 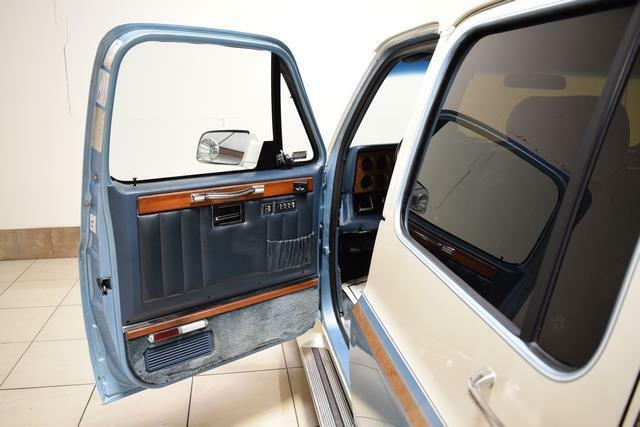 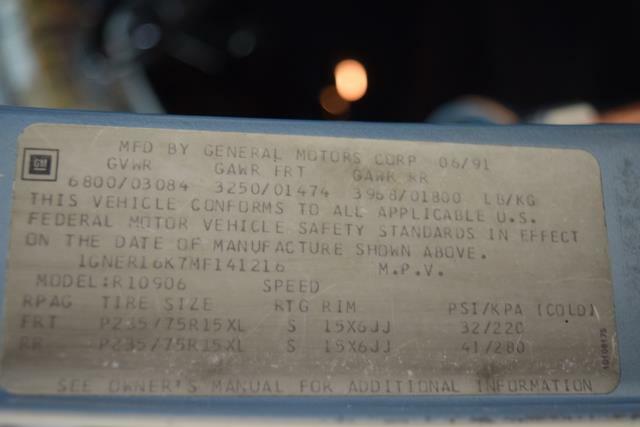 Below are Suburbans between 1973 and 1991 (7th Generation) with the Anaheim Industries Packages installed. 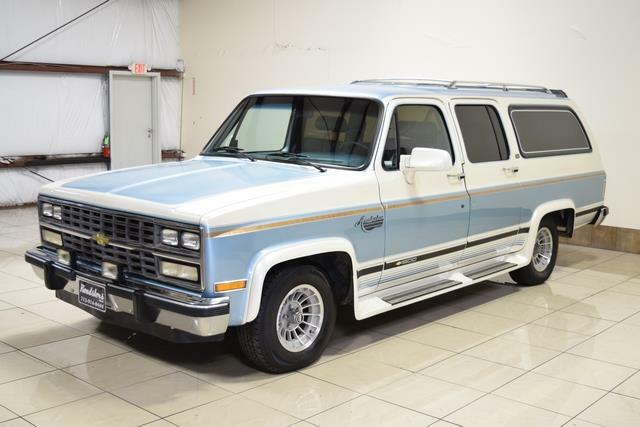 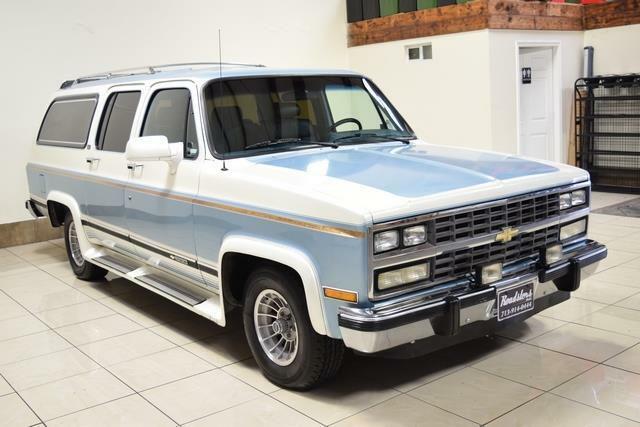 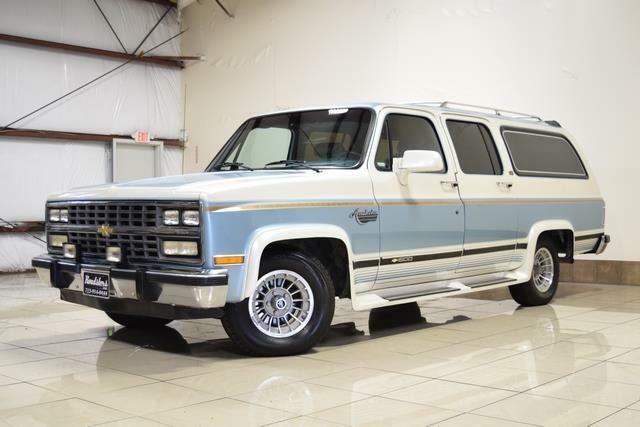 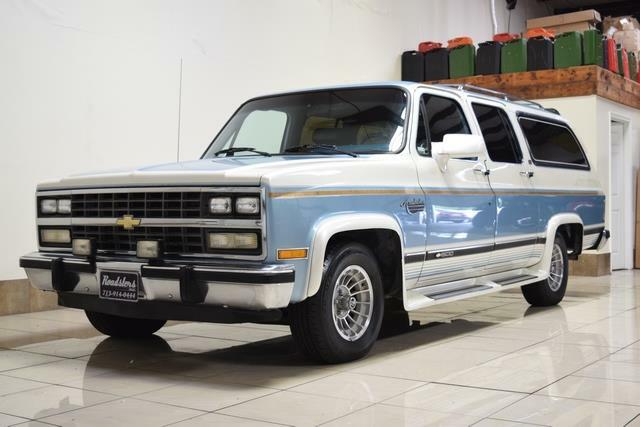 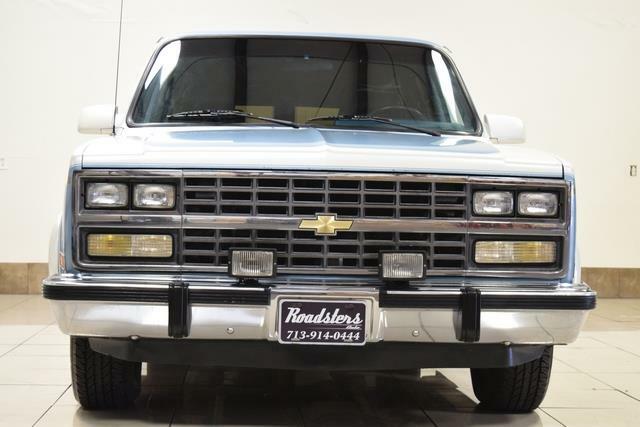 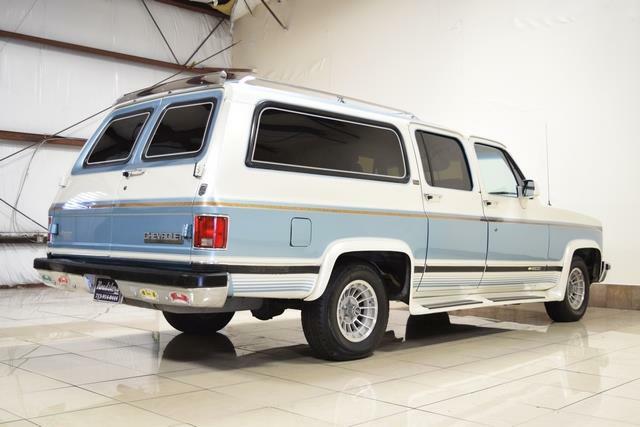 Description:A VERY HARD TO FIND 1991 CHEVROLET SUBURBAN, CUSTOM ANAHEIM EDITION, AMERICAN RACING 15 INCH WHEELS, 1991 CHEVROLET SUBURBAN! 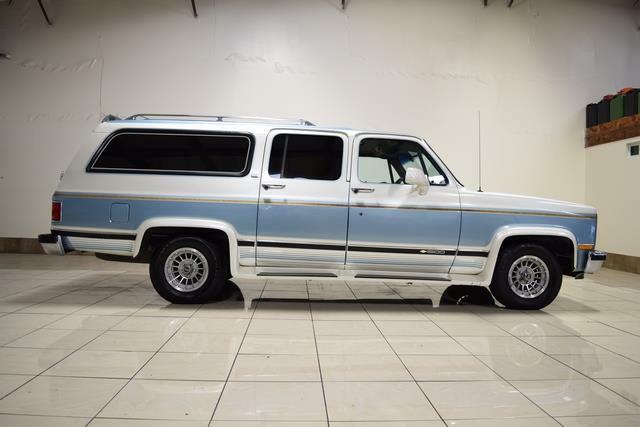 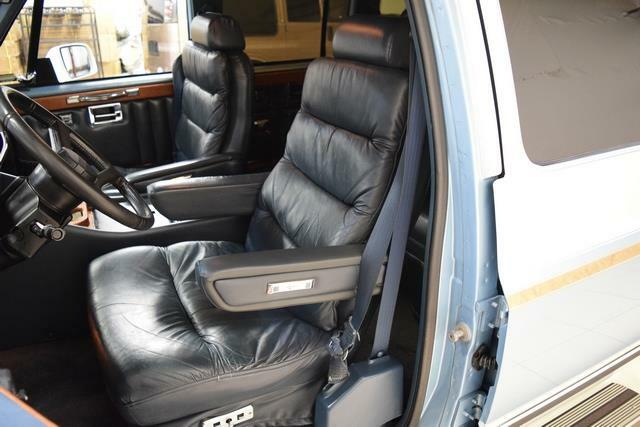 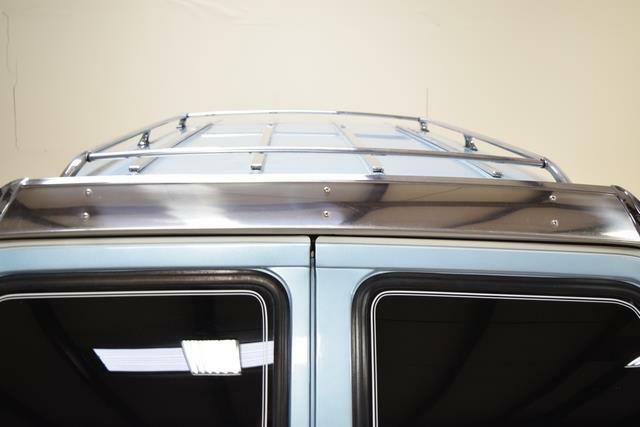 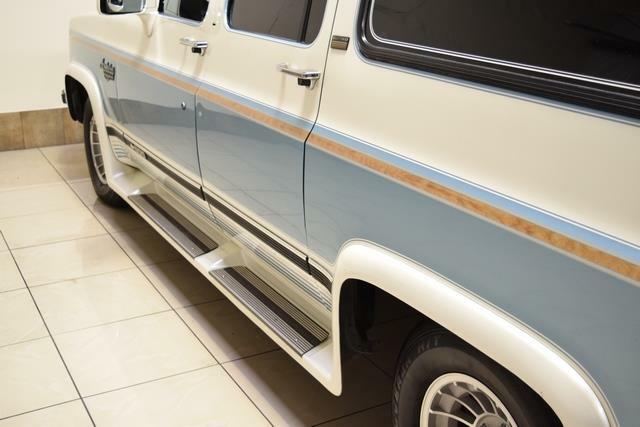 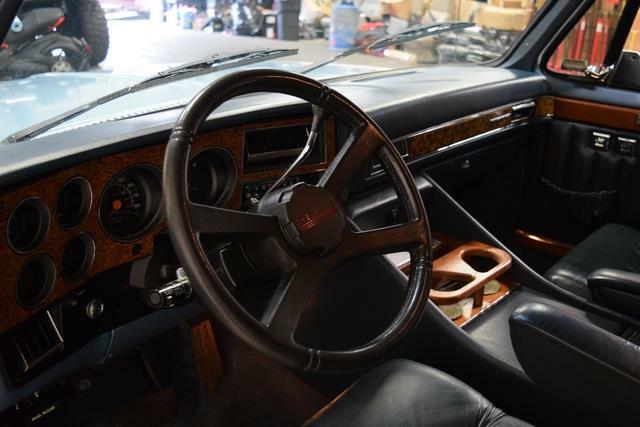 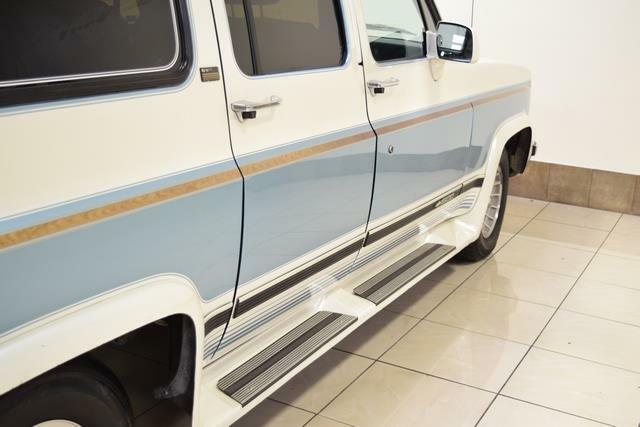 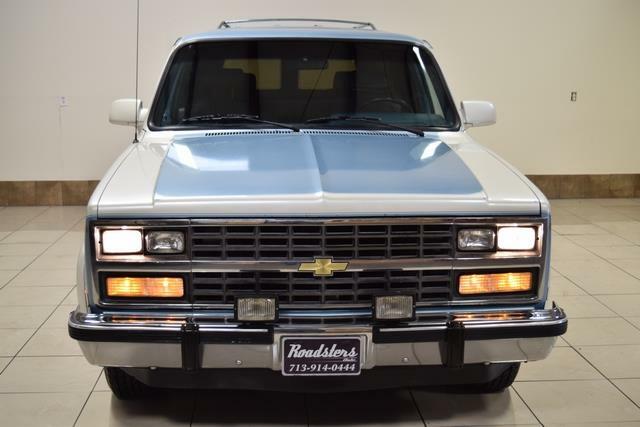 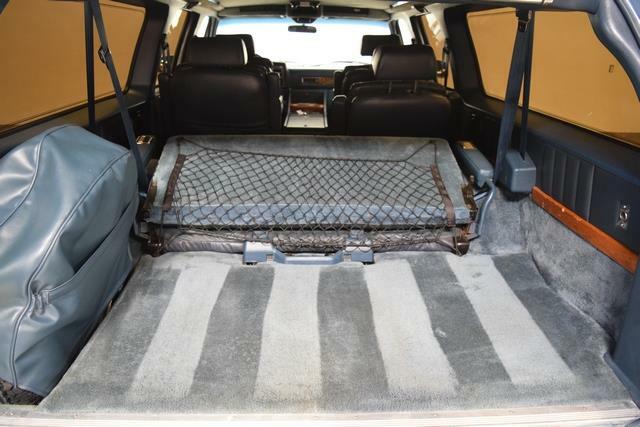 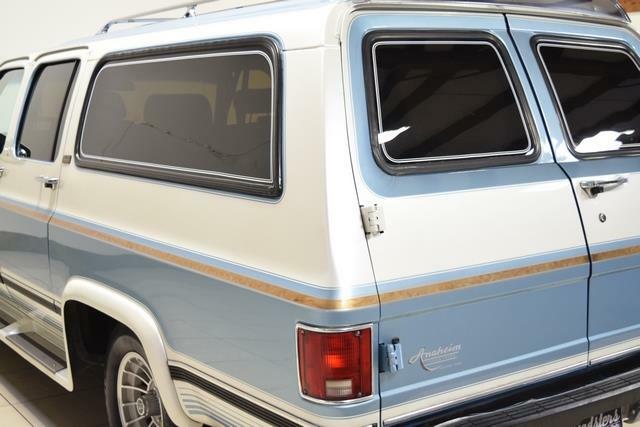 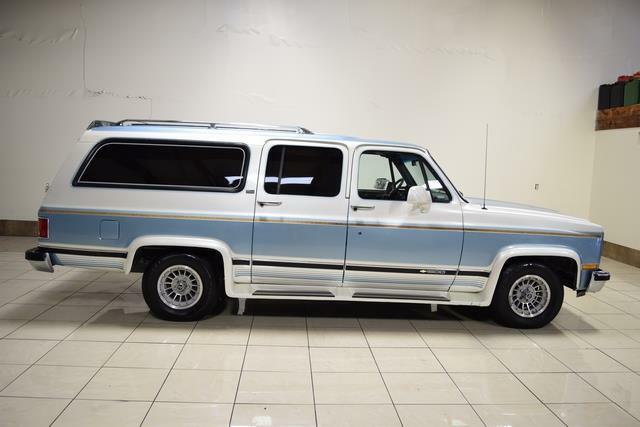 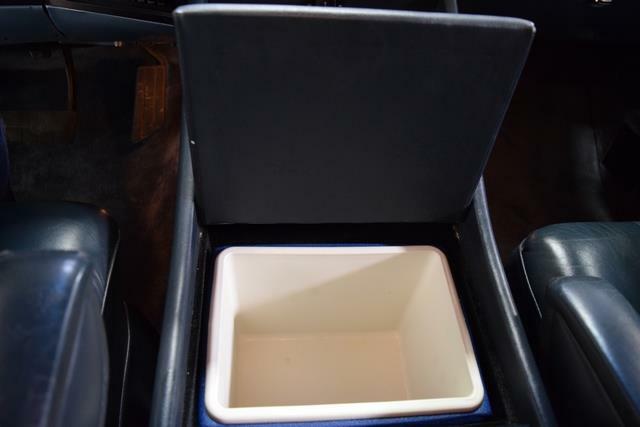 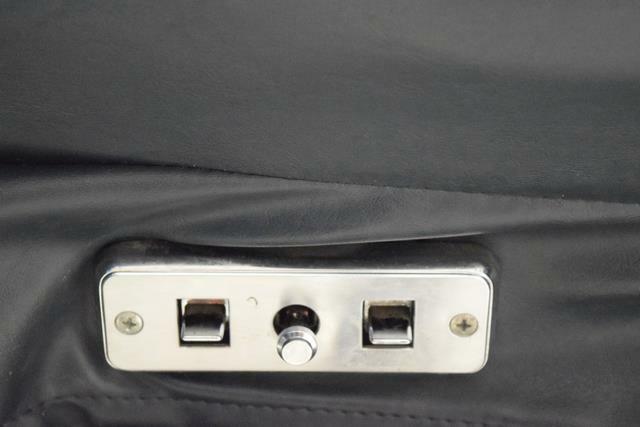 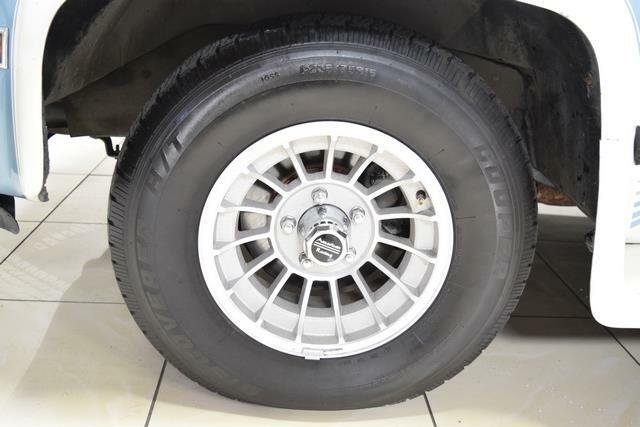 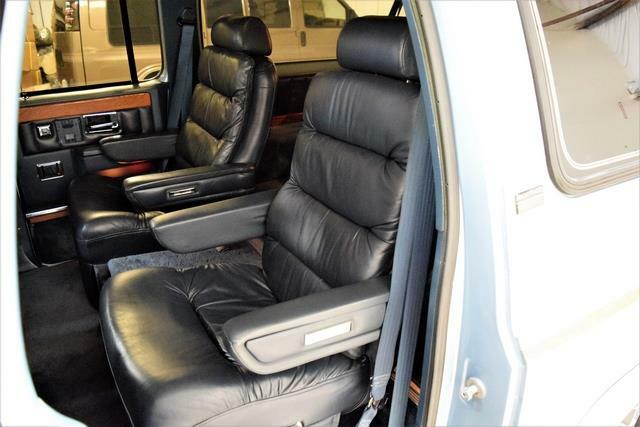 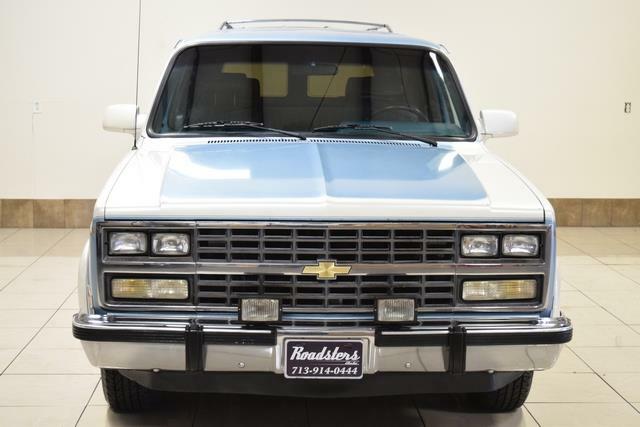 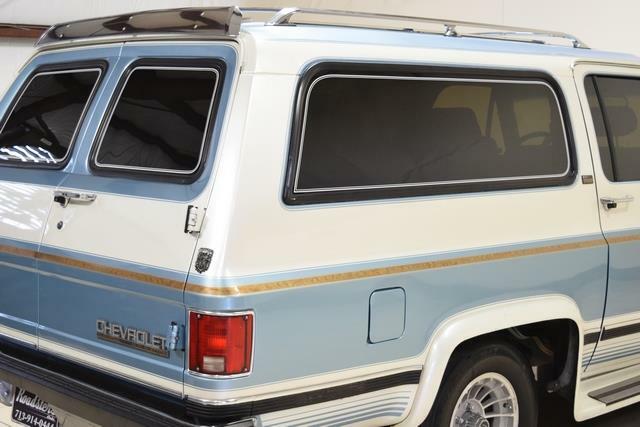 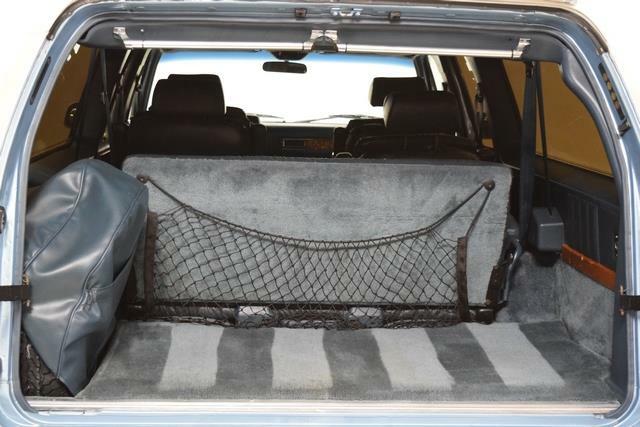 THIS GORGEOUS SUV IS FEATURING LIGHT BLUE & WHITE COLOR EXTERIOR ON BLUE LEATHER INTERIOR! 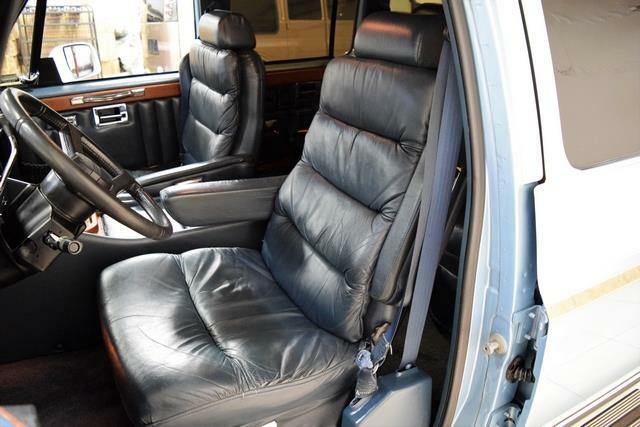 WITH 107K HIGHWAY MILES IT LOOKS CLEAN INSIDE AND OUT. 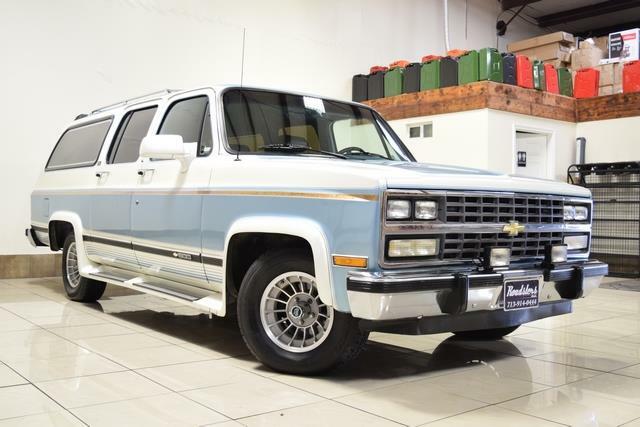 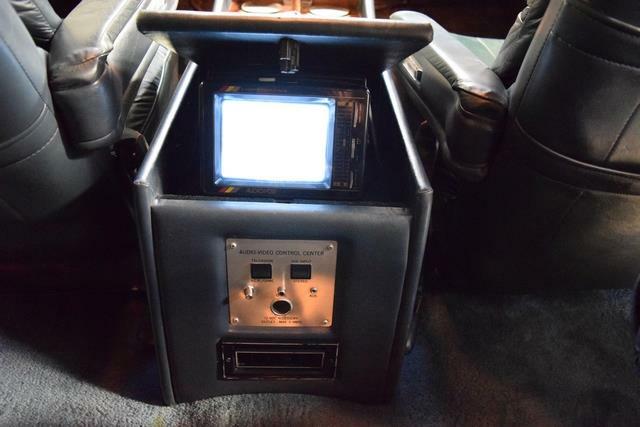 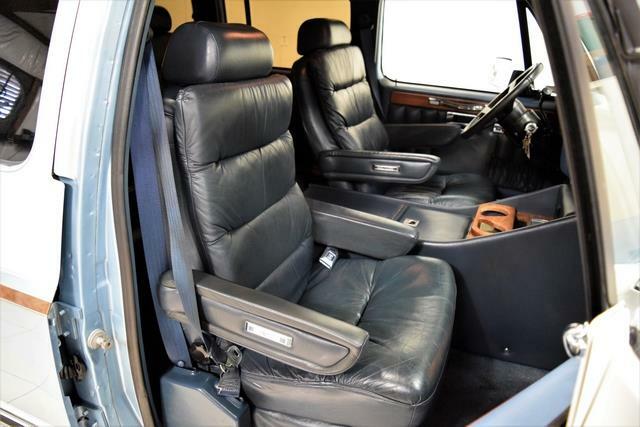 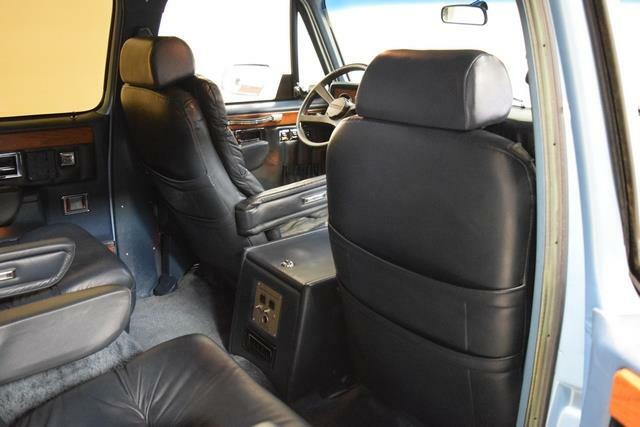 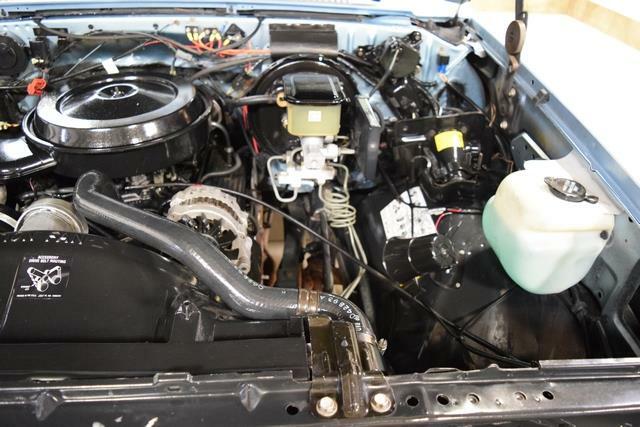 FULLY LOADED WITH OPTIONS SUCH AS POWER WINDOWS AND LOCK, POWER MIRRORS, AM/FM STEREO, AMERICAN RACING WHEELS, TOWING PACKAGE, BRUSH GUARD AND MANY MORE(SEE THE PICTURES FOR MORE DETAILS! 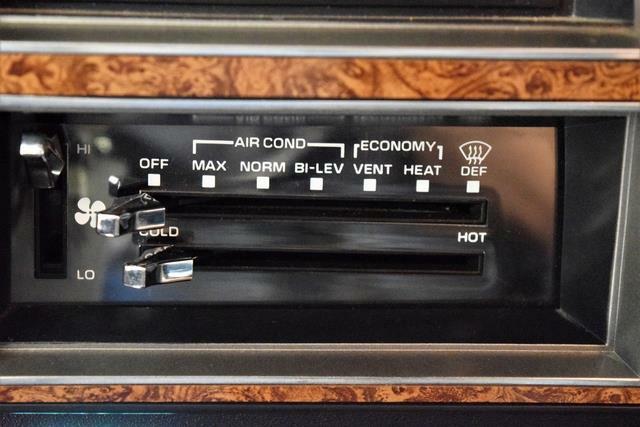 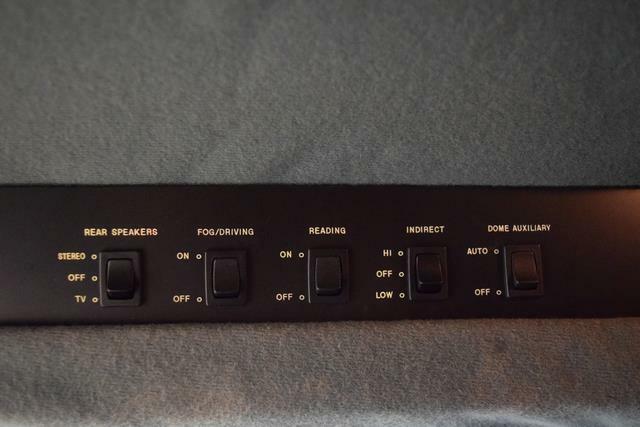 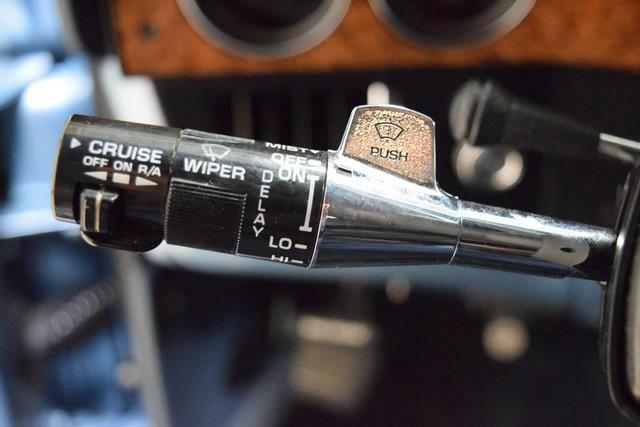 ALL THE OPTIONS FUNCTION ACCORDINGLY! 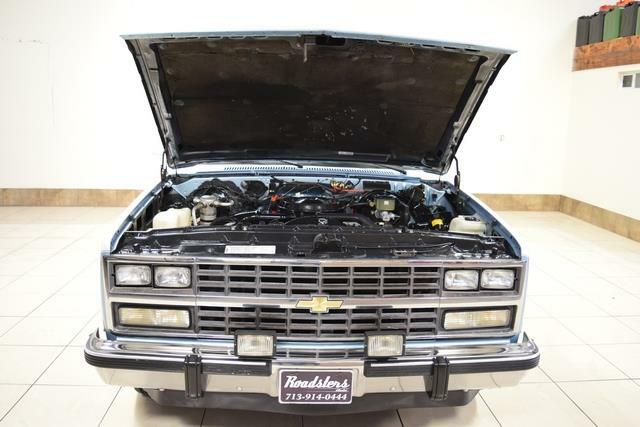 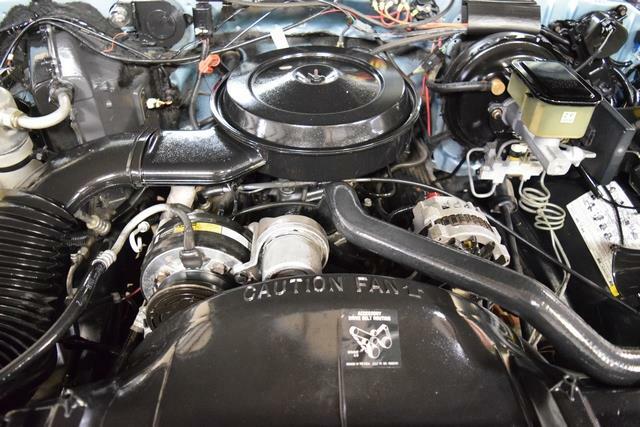 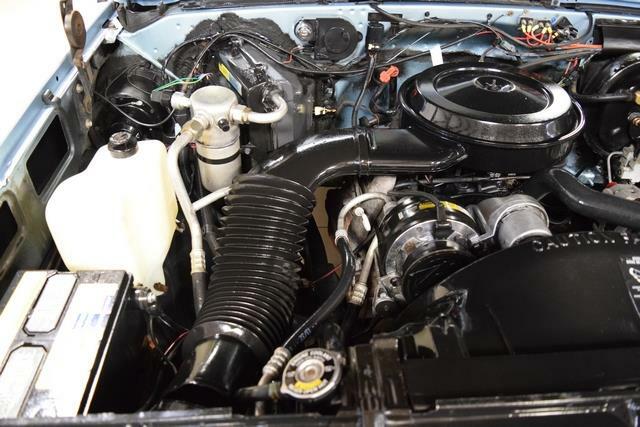 THE POWERFUL V8 5.7L ENGINE RUNS LIKE NEW AND THE AUTOMATIC TRANSMISSION SHIFTS SMOOTHLY INTO GEARS AND PROVIDES A LOT OF POWER! 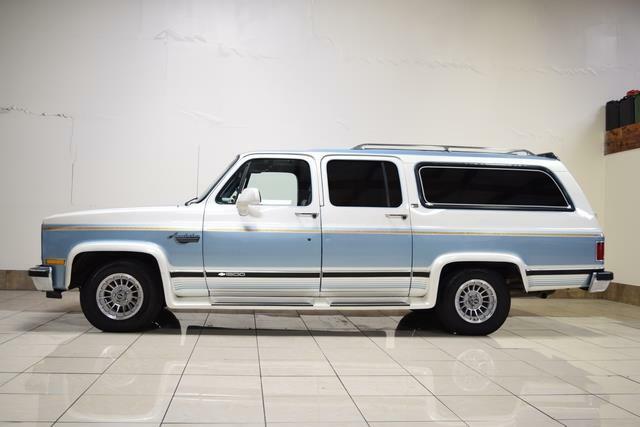 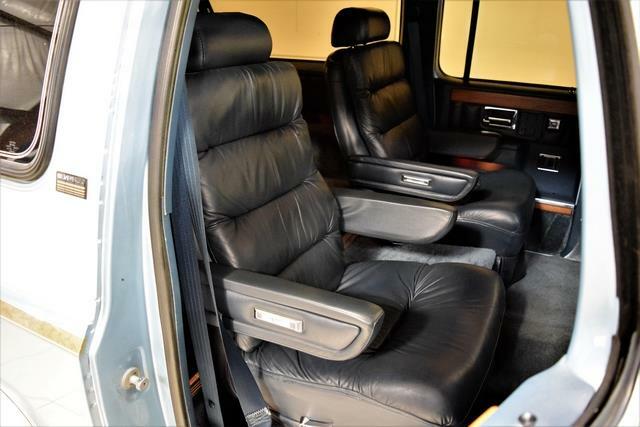 THE BEAUTIFUL LIGHT BLUE & WHITE COLOR EXTERIOR SHINES BRIGHT LIKE NEW AND THE BLUE LEATHER INTERIOR HAS BEEN KEPT VERY CLEAN!